Come join the fun at Woodbrooke Hills! Members must be present with the guests at all times. When the member leaves the guest must leave with them. Members with 10 or more guests require a private reservation on weekends and holidays. Individual guests are $5 per day. Guest fees packages are available. These will be in the form of a pre-purchased discount package loaded onto a member’s online account. Fees are 10 passes for $45 and 20 passes for $80. Children ages 5 and under are free. Guest passes do not expire, and will carry over to the next season if unused. Upon sale of your bond, any unused purchased guest passes may be refunded to the seller. Any “free” passes that are earned must be used by the bond holder, and are not transferable, refundable, or saleable to the future bond holder or any other member of the club. Guests of members who stay in the member’s home overnight shall be extended a rate of: Individual-$20 per week; Family-$60 per week.This weekly rate will apply for a consecutive seven day period. Applications for a house guest(s) must be made to the Club Manager prior to the guest(s) being admitted. Members must enroll nanny as part of their online account and pay a fee of $75 for the season (up to 2 nannies may share one pass). This allows the nanny the use of the club only when the member’s children are under their care, or when they are in attendance with the family. A party is considered a private party when a member is interested in reserving half or full party pavilion. Members with 10 or more guests require a pavilion rental on weekends and holidays. All parties can be reserved online and then approved by the Manager. All parties have a minimum two hour charge. Pavilion is not reservable when there are swim team, tennis team, or club functions. There is a party ratio requirement of one adult for every five children under the age of 14. Additional guards are provided for pool safety only and are not party assistants. Payment is refundable in full to your online account only within 72 hours of the party. In the event of inclement weather or non-functioning pool conditions, the Manager reservesthe right to cancel the party. If the party is cancelled by the Manager, a full refund will be given or the host is offered the opportunity to reschedule the party. Party hosts are expected to set up and clean up the party. Additional after party cleaningservice by the club may involve additional fees to the party host. Non-payment of these fees may result in membership suspension. All party guests must sign in at the front desk. All general club and pool rules apply. Parties are limited to serving beer and wine only as alcoholic beverages. No glass permitted. Hosts may bring in additional seating, tables, or accessories at own expense. Pre-approval by Manager is required. Half Pavilion Party: Accommodates up to 60 attendees (club members included). This is the count for the entire party attendance, not the number that will be in the pavilion at any given time during the party. Includes six picnic tables, one grill, pool access, tennis court access, bath house access. $75 per hour, two hour minimum, billed to the whole hour. Whole Pavilion Party: Accommodates 61 to 120 attendees (club members included). This is the count for the entire party attendance, not the number that will be in the pavilion at any given time during the party. 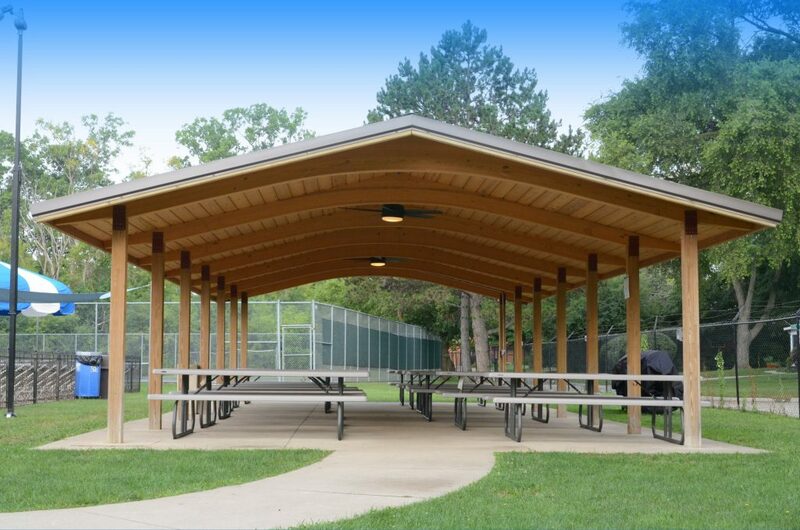 Includes 12 picnic tables, 2 grills, pool access, tennis court access, bath house access. $125 per hour, two hour minimum, billed to the whole hour. Oversized Party: Accommodates over 120 attendees (club members included). This is the count for the entire party attendance, not the number that will be in the pavilion at any given time during the party. $150 per hour, two hour minimum, billed to the whole hour. See Manager for more details. Additional Rentals: Once the whole pavilion has been rented for a party, members have the option to add on additional tent rentals as follows. Club staff will provide free set up and take down of tents. Please book with the manager in advance. Are you interested in becoming a member? Please submit your information below and we'll get in touch with you about joining Woodbrooke Hills. Current members with comments or questions, please email communications@woodbrookehills.com.